Sparkly Bingo Review | Claim 120 FREE Tickets On Deposit! It’s not just magpies who are attracted to shiny things – Sparkly Bingo is too! This top online bingo site has all the shimmer and sparkle of a Tiffany’s jewellery store but isn’t anywhere near as expensive. Who needs diamonds anyway when you can have big bonuses and free bingo? When you join Sparklybingo.com you’ll be showered with free gifts. To start off with, you’ll get 120 free bingo tickets as soon as you deposit £10. If you like what you see and decide to stick around you’ll unlock further free tickets on your second and third deposits too. As if that wasn’t enough new players also unlock 24 hours of free bingo immediately upon registering an account, no card details required! This provides a great way of playing some bingo and getting a feel for the site before making a deposit. Free tickets on your first 3 deposits. Earn diamonds as you play and redeem them for VIP rewards. Get rewarded for every friend you refer to the site. 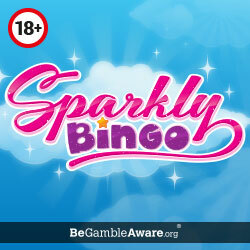 You won’t find any promo codes at Sparkly Bingo. Not that you need any as all of the bonuses and promotions are all automatically applied for you! Sparkly Bingo doesn’t have a mobile bingo app but this isn’t a bad thing. It just means that you can play on the go without going through the rigmarole of downloading an app. Instead, you can play on the site as you would on a desktop computer and you’ll get the same gaming experience as this is a mobile responsive site so it will adapt to the size of your screen. If you’ve played at the site before you can sign in with your existing login details but if it’s your first time you’ll need to register before you can get started and you’ll be pleased to know that mobile players are also entitled to the no deposit bingo plus the free tickets on deposit. If you want to get your hands on some glittering cash prizes then this is the site for you because there’s a huge library of games offering you plenty of chances to win. What’s more, this is one of the cheapest sites around so you’ll find that your money will stretch quite far. Mad about bingo? Then check out the range of 90 ball, 75 ball and 5 line bingo games available. The bingo tickets start from just 1p and they really don’t get any dearer than 50p so you might even decide to play multiple games at the same to maximise your chances of winning. You should also take advantage of all the free bingo on offer. There are 3 free bingo rooms spread across the ‘Free’ tab. There’s also the five £1,000 Lovely Loot games that take place every Friday evening from 7 pm. Tickets to these games are free as long as you have made a deposit in the previous six days. We can’t think of a better way to end the week than winning a share of £5K without spending a penny! If you want to further boost your chances of winning then there’s plenty of reels to spin in between bingo games including top titles such as Temple of Isis, Stardust and Rainbow Riches. 120 free tickets when you add £10. Bonuses on your second and third deposits. Lots of chances to win. Bingo tickets start from as little as 1p. Customer support available 24 hours a day, seven days a week. Not as many promotions available as some of its sister sites. Powered by Dragonfish software and licensed by Cassava Enterprises. Minimum first deposit amount of £5. Minimum withdrawal amount of £5. If you are a fan of free bingo games and like getting started with a juicy no deposit required bonus, Sparkly Bingo will be exactly what you are looking for. All new players get access to no deposit free bingo games. The site isn't just for freeloaders, if you fancy making a small deposit and risking some money you will be rewarded with a steady supply of free bingo tickets over your first three deposits thanks to the rewarding welcome bonus. Other perks include daily guaranteed jackpot games, huge progressive jackpot slots and real money games starting from just 1p. Make sure you get started now and grab your freebies!